Below are my solutions for the 150 levels of Flow Blue Pack. 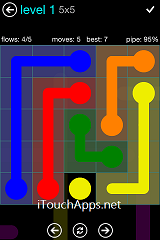 One thing that’s different between my solutions and some of the other solutions out there is that, my solutions don’t have pipes that loop around and around just to fill up all the squares on the board. You’ll notice that in the images, the last square is left open so that I could capture the image before the “You completed the level in ? moves” screen appeared.